In parallel with the Städel exhibition, a display of works on paper by the painter, draughtsman and printmaker Gèr Boosten opens on 21 March in the basement of the Hôtel Lévis-Mirepoix. Boosten was born in Maastricht in 1947, and lived there until 1996, when he and his family settled in France. For the last ten years he has lived and worked in a converted hangar in the village of Poilly-lez-Gien, 140 kilometres to the south of Paris. Boosten is a Dutch-born artist with, as he says himself, a French spirit, so an exhibition of his drawings in the Paris house of a Dutch drawing collection seems entirely appropriate. In staging shows like this, the Fondation Custodia turns the spotlight on contemporary artists who know their Classics. They are not nostalgic, but they do have an understanding of the history of drawing. They are artists who have no desire to break with tradition, but seek to continue it; artists for whom the work of the draughtsmen of the Renaissance, the Golden Age and Modernism is still a source of inspiration today. In the recent past the Rue de Lille has hosted, among others, Peter Vos’s Metamorphosis drawings, and, earlier this year, the works on paper by painter and sculptor Arie Schippers. On his return to the Netherlands Boosten graduated with drawings and paintings of crowds of ordinary people, crammed together in buses and trams or smoking and drinking at large tables. He drew people pushing and shoving, mini rebellions and murders. The setting is often stage-like: the figures stand and lie on the wooden planks of a shed floor or on a piece of flat land stretching in perspective to a high horizon. Beds, tables and stoves look like pieces of scenery, curtains and washing lines like stage wings. After taking his finals at the Jan van Eyck Academy in Maastricht, Boosten stayed on and took a course in set design. His teacher, the painter, printmaker and set designer Nicolaas Wijnberg (1918-2006), soon became a good friend. In the nineteen-seventies Boosten designed sets for the Groot Limburgs Toneel and the Amsterdam theatre group Globe. His sets for Hugo Claus’s plays Suiker (Sugar) and Een bruid in de morgen (A Bride in the Morning) have a great deal in common with his ‘Yugoslavian’ etchings and drawings. Ger Luijten of the Fondation Custodia came across Gèr Boosten’s work a decade or so ago, when he was the keeper of the Rijksprentenkabinet in the Rijksmuseum in Amsterdam. The first etchings and drawings by Boosten came into the collection there as part of the Nicolaas Wijnberg bequest. More works were added to the group later in consultation with Boosten. 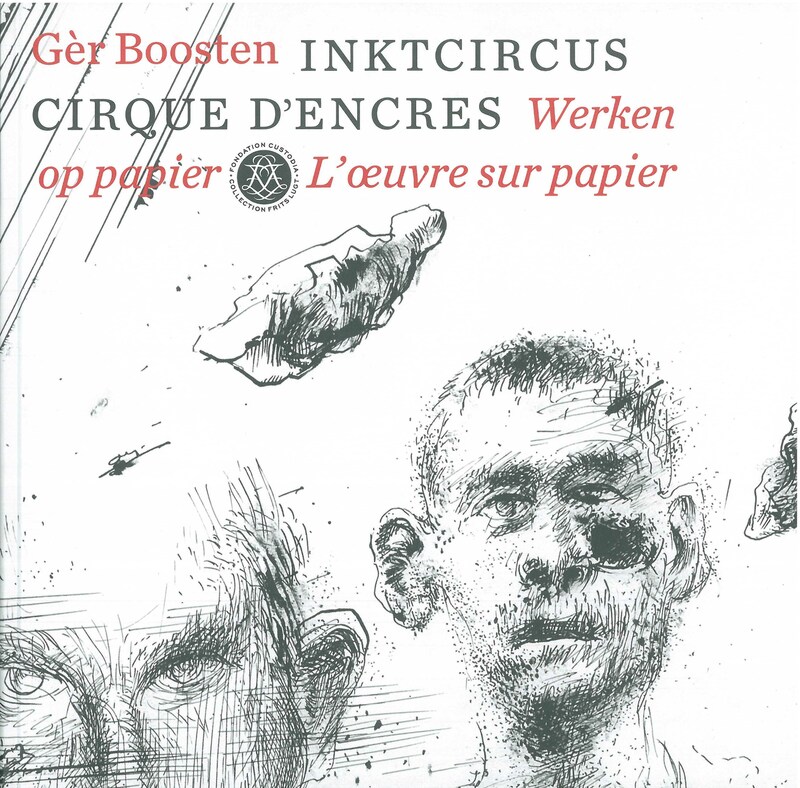 Last year Boosten gave a series of etchings to the Fondation Custodia. The exhibition at the Fondation includes some of these etchings and other early prints, a selection from Boosten’s sketchbooks and a series of large pen and ink drawings he made recently. 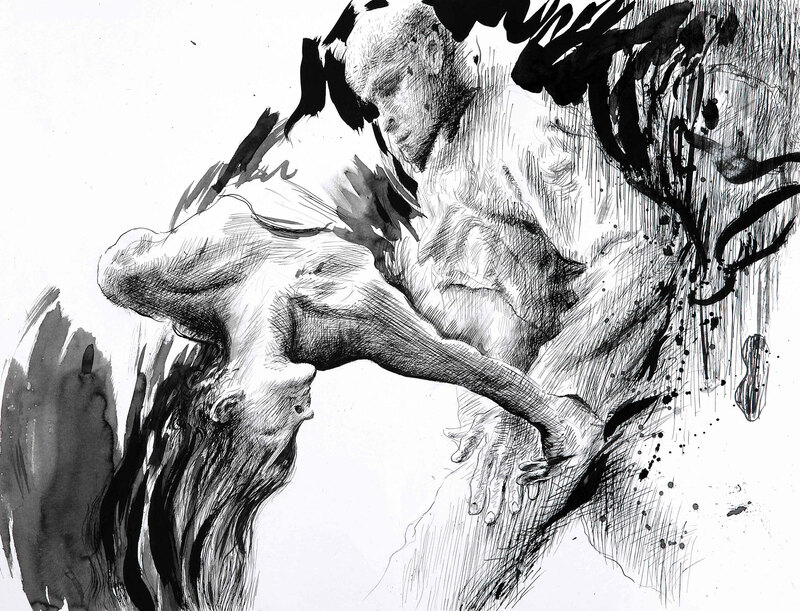 In these new drawings, men and women are struck by flying chairs and shoes or by stones from space. They are attacked by dogs and wolves or by one another. People are injured, people are killed. Boosten’s work is as theatrical as ever and still deals with la condition humaine.